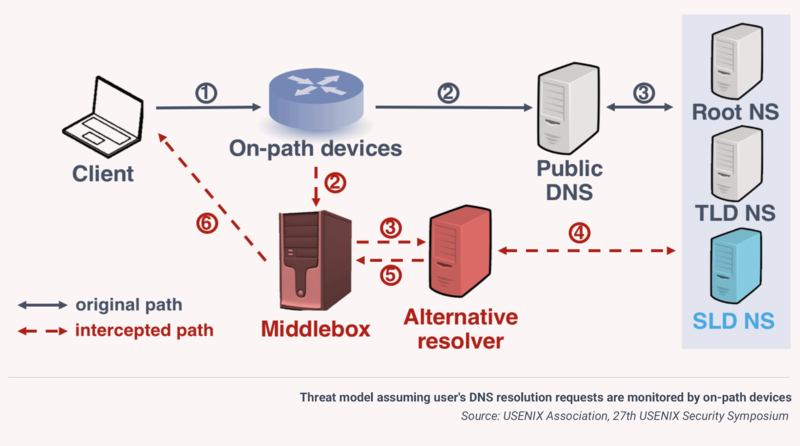 During the 27th Usenix Security Symposium held in Baltimore, MD last week, a group of researchers from China revealed results obtained from a large-scale analysis DNS interceptions. The research was based on incorporating a novel approach to detect DNS interceptions and leveraging 148,478 residential and cellular IP addresses around the world for analysis. From the report: "[We] find that 259 of the 3,047 ASes (8.5%) that we inspect exhibit DNS interception behavior, including large providers, such as China Mobile. Moreover, we find that the DNS servers of the ASes which intercept requests may use outdated vulnerable software (deprecated before 2009) and lack security-related functionality, such as handling DNSSEC requests. Our work highlights the issues around on-path DNS interception and provides new insights for addressing such issues."